Like Mother Mary, Kannon is an expression of the feminine aspect of the divine, a personification of love and compassion, a savior in calamity, and a miracle worker. She appears to her devotees as a lovely, gentle lady of heavenly beauty, sometimes exuding the scent of sweet flowers. Much like the Virgin Mary, the Chinese Kuan Yin is said to have lived a human life of extreme self-sacrifice and holiness before she ascended into heaven and became a celestial Goddess of Mercy and Compassion. Since her ascension she has been appearing as “a woman in white” to those in need of help. Her devotees respond to her loving care by honoring her on her birthday and coming in pilgrimage to her holy places on mountains, in caves, and in temples. Here is an account of what may happen there: “Huang Kuei-nien and some companions undertook the pilgrimage to P’u-t’o Sha. They went to the Cave of Tidal Sounds and prayed with great devotion, chanting the name of Kuan Yin. Suddenly they saw a brilliant light, and Kuan Yin appeared, sitting on a rock above the cave. So moved was Huang that he vowed to dedicate his life to studying the Buddhist scriptures, eating only a vegetarian diet, and refraining from killing.”(*3) All this sounds totally Marian to me. Some trace the striking similarities between Mary and especially the White Clad Kuan Yin back to the historical influence of Christians in China. Martin Palmer and Jay Ramsay tell the story of Nestorian Christians coming to China in the early 600’s. (*4) Nestorius was a deposed Archbishop of Constantinople who died around 450 C.E. It is ironic that part of his heresy consisted of refusing to call Mary the "Mother of God" and yet his influence in China helped elevate Kuan Yin to a quasi-divine status. God/dess works in mysterious ways indeed! The Nestorians did venerate the Mother of Jesus (just not as the "Mother of God") and imported images of Madonnas all over Persia, Arabia, along the Silk Road, into Mongolia, China, Tibet, and India. At the time the Chinese were longing for the divine feminine, and Chinese Buddhism needed someone who could compete with the powerful Taoist goddesses. 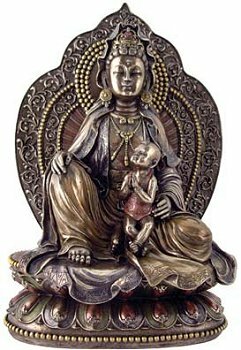 So the Madonna with child struck a cord and merged with Kuan Yin, the one women prayed to for babies, usually baby boys. Hence Kuan Yin as the child giver came to be depicted with a baby boy either in her arms or beside her. In the photos above we can trace the development from Kuan Yin to Maria Kannon and from a relatively detached female bodhisattva who delivers babies to others to a “loving Mother” (Jibo Kannon) as the Japanese call Kuan Yin when she holds a baby close in her arms. Other forms of Kannon reminiscent of Mary are called Koyasu Kannon (child giving and rearing) and Juntei Kannon (pure one). 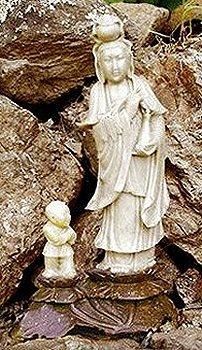 For great photos and more information click on Mark Schumacher’s article "Virgin Mary & Kannon, Two Merciful Mothers" He says that one can sometimes tell a Maria Kannon from a loving mother Kuan Yin statue when a Christian cross was hidden somewhere on the work. But often it is up to the observer whether s/he sees a statue as a representation of Mary or Kannon. E.g. the Kuan Yin in photo 3 looks like a Chinese Virgin Mary to me. Even though Buddhism hasn’t directly commented on Mother Mary, it prepared me personally in many ways for following Our Lady of Apparitions. First of all, the practice of Tibetan Buddhism familiarized me with the notion that the Absolute appears to sincere seekers in many forms, be they celestial visions or temporary human forms. It is always understood that these forms the Absolute takes on – while as real as our own forms – are not absolute in themselves. Rather, the Absolute manifests them temporarily for our benefit as an image portraying and transmitting divine qualities. Their essence transcends any image or form and is said to be “the union of emptiness and clarity”. Just like our essence also transcends our forms. According to Buddhism we too are mere apparitions. Our true nature goes far beyond what our bodies make us believe. So when someone asks me: "How can an intelligent person like you believe in apparitions?!" I always answer: "But we are all apparitions in this dream we call life!" I guess Christians don’t know what to make of the Virgin Mary forming out of light, because they are to believe in the resurrection of the body and the bodily assumption of Mary into heaven. But I think their notion of what “body” means in heaven is too worldly. The Buddha’s “body of truth” (dharmakaya) for example, is the limitless expanse of the universe, present everywhere. Second, Buddhism helped me prepare for what in Christianity is called “consecrating yourself to the Immaculate Heart of Mary”. It has significant parallels to Tibetan Buddhist initiations or “empowerments”. Both are about merging with a celestial person and then with the divine essence it represents. In 1992-‘93 Mother Mary presumably appeared in Colorado (though these apparitions are not yet accredited by the Church). There she said: “My dearest children, I come to offer you my greatest gift – to give you my love in a most special exchange, my heart for yours. In this exchange, you shall make the Act of Consecration to my Immaculate Heart, thus partaking in my triumph.”(*5) – This strikes me as very Buddhist, because she is calling us to let go of our separate selves in order to become divine instead. Part of the Christian consecration as well as the Buddhist initiation is a spiritual commitment to do a certain practice every day for the rest of ones life. This is a hard thing to do in a society where no one seems to commit to anything for life anymore. My Tibetan guru Kalu Rinpoche taught me about commitment. I took my first initiation without a clue about what I was doing or that it entailed a commitment. After that, I went to him on three separate occasions with some question completely unrelated to the initiation. Each time he apparently took one look at me and could tell that I wasn’t keeping my commitment. So each time he asked: “Are you keeping your commitment?” The first time I said: “What commitment?”, the second time: “Can I do it in English or in my own words?”, the third time: “Well, yes, sort of, more or less.” Since he had asked me three times I figured he was really serious about this and that this was an issue of much greater importance than my unenlightened mind could fathom. So I started to keep the commitment strictly. (It only entails a short prayer repeated seven times every day.) He never asked me again, didn’t have to, he could “see” with the eye of enlightenment that I was keeping it. Nothing less could have convinced me of the importance of strictly keeping my present commitment to Mother Mary which entails three fairly long meditation sessions a day, including praying three rosaries, and generally obeying Our Lady’s wishes as much as possible. Speaking of obedience. That’s the third thing I wouldn’t even have considered without a Buddhist understanding. It’s a big topic among Mary’s devotees and a training in ego-detachment. If you understand that a separate self with a separate will is ultimately an illusion that leads to nothing but suffering, it makes sense to practice letting go of that self by being obedient to God/dess. When you know that obeying God/dess leads to the ultimate peace and happiness of nirvana or divine union it is a little easier to accomplish. Fourth, Buddhist meditation practice also helps with the rosary. For details see my article “Praying the Rosary: a Different Approach"
Fifth, from a feminist perspective I’m always suspicious when I hear people say how Mary is not to be the goal of our path but only the way to the male trinity. But from a Buddhist point of view I understand that all forms of celestial persons (not just Mary) are a doorway to the formless, the ground of all being, which Christianity calls God Father. So in that sense, yes, Mary leads us to the Father, not to herself as a separate form. Nonetheless one could express the same truth in a less patriarchal way, by saying that Mother Mary as well as Jesus lead us beyond forms to the essential, ultimate truth which transcends any words and concepts. On the other hand, the Heart Sutra teaches us that: “Form is emptiness; emptiness is form; form is not different from emptiness, nor emptiness different from form.” (Christians would say: “God is immanent and transcendent.”) So the form of Mother Mary leads us to the formless Father, but then the formless Father also leads us back to Jesus and Mary, because they are all one. Buddhism acknowledges that the apparent stability of our material world is an illusion. In reality everything is energy, constantly changing, and impermanent. Natural laws are in effect only as long as one is under the spell of worldly illusions. Once one is completely freed from them, especially from the notion of a separate self, a much more large and beautiful universe opens up. Let me warn you though, in order to “loose the ground beneath your feet” safely, you need a true master for a teacher. Mother Mary is one such master. * 1. Martin Palmer and Jay Ramsay with Man-Ho Kwok, Kuan Yin: Myths and Prophecies of the Chinese Goddess of Compassion, Thorsons Publishers, London: 1995, pp.8-9 and 25. * 2. Ibid. 25, etc. * 5. In the End my Immaculate Heart Will Triumph: Consecration Preparation for the Triumphant Victory of the Immaculate Heart of Mary, Queenship Publishing Co., (800) 647-9882, p.10. The martial language in this booklet is sometimes hard to take, but the rest is well worth it.